The saltwater fish system is moving along! 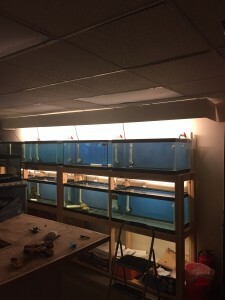 Light covers on the top row of aquariums have been installed by our resident carpenter. (Don’t forget, we can have him build you a custom aquarium stand. Exponentially nicer than the fish tank stands you will find elsewhere!) The coral system is ready for some reefin’, and corals will be in soon. The vlamingi tangs in the pond have adjusted nicely, and will eat fish food right out of your hands!